- Bamboo Grrl: 33, 5' 10", 170 lb, 156 cm snowboard, 1 years riding. The first thing you notice about this board is just how lovely it is. Talk about a looker, this one is that. The board is not often seen, so you'll be sure to get lots of positive comments on it, at least I do all the time. If having a unique board appeals to you (and it does to me) then you'll love this one. I learned how to ride on this board actually and have progressed very quickly. It is a great deck to learn on because it turns very easily and is soft enough to be forgiving. Once I got going into getting some air, ollies, etc, I realized that it has tons of pop. From what I've read, I think the construction of the board plays a big part in it. Regardless, expect big ollies and a good bit of flex here. Also, I learned how to carve on this board. For that, it was especially nice as it has a small sidecut radius. End result being that you can turn easily and tightly at low speeds - perfect for learning to carve on moderate slopes. Those same fast turn characteristics make it a good deck to tackle moguls on. While the board is soft IMO, it is definitely edgy though, so be careful on rails if you do those. The downsides? At higher speeds or bumpy terrain or worst of all, fast & bumpy terrain - things start to come apart a little. The board doesn't feel nearly as stable or secure. I find it rather unnerving actually to bomb anything more than green runs - on a decent blue run with some bumps, it can sap your confidence. I've encountered some chatter while carving at higher speeds, those distinct wavy trench lines, especially on the heelside. I think a lot of women's boards, at least mainstream ones, aren't much made for serious, hard riding - unless you are small or lightweight. If you are, then this board would be perfect. Or if you are comfortable riding at a more relaxed pace, smaller terrain, or mostly in the park (except rails, you'd want to detune the edges for those) then it's all good. It will be fun on mellow terrain, you'll hit big ollies (and nollies too, my favotite! ), do surface tricks (like presses and butters) with style, etc. If you want to ride big terrain with speed and confidence, fly down the steeps, or launch big carves, things will get sketchy very quickly. That's the catch-22, the board has lots of pop and is very lively so it has great feel, but unfortunately, for those same reasons, it does little to dampen all those bumps as well as cut-up snow. I'm getting a bigger board, probably another Arbor, like a crossbow, this week. I'll post a review on that soon. - Hanna Who: 26, 5' 6", 125 lb, 152 cm snowboard, 2 years riding. I've ridden out in real snow, and in the east coast ice, and this board has yet to dissapoint. It has great flex for messing around. 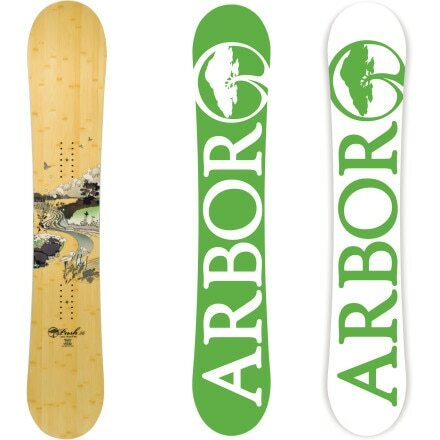 I used to have a Burton feelgood, but the Arbor stomps it. Can't vouch for trying it out in a park (boxes & rails), but if you are looking for a board that can handle any conditions and mountain style riding, this is it! - Seilek4454: 20, 5' 10", 140 lb, 156 cm snowboard, 1 years riding. I am brand new to the boarding world and purchased the Push as my first board. I wanted something that wouldn't let me down as I progressed. I LOVE it! It's fast and carves like a dream! I would highly recommend this board to those just starting out or even those with a bit more experience. - Anonymous: 27, 5' 4", 135 lb, 156 cm snowboard, 10 years riding. - Big mountain, glades, backsides and groomers when necessary to access these. Powder. - Advanced terrain but not aggressive. - After riding the same board for 10 yrs(!! ), I finally got a new one for this season. I have ridden her 5 full days now on ice, moguls, groomers, powder and packed powder. - I wanted something that would float on powder but still get into tight trees. - I wanted a women's specific all mountain board made by a relatively green company. I jumped from a 145cm board that I could whip around trees to a 156cm and was worried about being able to turn sharply around trees and moguls - no need to fret. I've found the Arbour Push is fast, responsive and floats on the fresh powder. It is great for carving on the groomers, stable at high speed and easy to predict. It handles transitions between powder and groomers well, and handles both light and heavy snow well without tossing me around. Its stable on flat traverses at high and low speeds. It handled the little bit of ice encountered well and with little chatter. Really fast. On groomers and bumps I work pretty hard to keep her to a reasonable speed, and it takes more effore to bring the tail end around some sharp turns. These could just be an adjustment I need to make since the last board I had was so short. I'd highly reccomend the board. I debated most of last season whether or not I wanted to upgrade my older K2 Luna to an Arbor Push. After reading seemingly endless stellar reviews online I pulled the trigger and bought the Push. I wish I had done it sooner!! The first thing I noticed about this board is the super fluid maneuverability. Turning is smooth and initiates easily even on steeper terrain (definitely a plus). Another huge difference I felt between the Push and my ex Luna was when carving. This Arbor 's got teeth- it really grips the mountain and combining that with the fluid turn initiation makes for heavenly carves on nearly every type of snow. I hit everything from icy groomers to crunchy nerds to silky powder and the Push handled it all. The camber gives just enough umph to propel you out of turns when you're shredding hard to keep you from catching an edge. Also notable is how stable the ride is, be it on the chunk or smooth flatter runs. The only draw back of this board is that it dings easy but still not as easily as my Luna. I would not recommend the Push for beginners- the coolest features of this board (sidecut, camber etc) would be best utilized/handled by intermediate riders. This is a great board to step up your riding and although the Push is not the best choice for days when it's dumping powder it'll still hold its own. I would recommend this board to intermediate lady boarders that ride the whole mountain and push themselves. The more aggressive the better! I'm really happy I bought the Arbor Push. I've boarded for 10+ years and I like to bomb it down the slopes. This board is so fast that I have to watch my speed. Its also super responsive and stable so the chatter doesn't throw me off and I can stop/turn on a dime. It truly felt like I was surfing the mountain the first time I rode it! I've retired from the park so I can't say anything about doing tricks with this board but its perfect if you are looking for speed and stability! Shay is reknowned for being a women's snowboard expert, we highly recommend her site for very specific, unbiased reviews. Check out her site! I looked @ many boards (both men's & women's) before deciding to take a chance with this one. I'd have bought a Rossi Diva Magni if my preferred size hadn't sold out. I'd have bought a Burton Lipstick if Burton made a channel binding that was strap-in, but after much thought & shopping, a bought a 156 Arbor Push & K2 Cinch bindings. Today was my first day on the board & among the worst of Michigan's ski conditions--hard-packed ice from days of +40, nights in the low teens & groomer pits, ruts, and balls everywhere! WOW! Holy Edge Hold! I was able to ride the steeps pretty well (considering it was my first day on new board & bindings) & was blown away by the the speed, stability & snappy response of this board. It's FAST...too fast, perhaps for my 1st day with the K2 Cinch Bindings--but I'm confident they'll work out fine once I get used to taking off before I'm fully strapped in. I've read some reviews that this board is on the stiff s ide, and that it's easy to catch an egde. I say NOT!!! It's super light, super resposive, quick to turn...REALLY QUICK...and rock-solid stable on ice. My last board was a 153 2007 Rossi One...an all mountain Panzer tank & trusty agent of my will, but HEAVY & somewhat of a dog for snappy turns & a sinker in (rare) Michigan powder. I love my new board! My only caveats would be: If you don't like to go fast, find a different board!!! And buy a little longer than you'd otherwise ride because this board is super light -- don't sweat heavy bindings...you may like the extra weight! Did I mention, this board is freaking gorgeous? Buy a clear stomp-pad! No Arbor Push snowboards were found on eBay at this time.